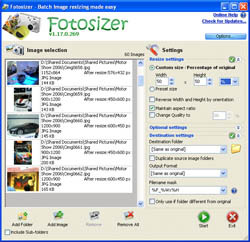 Fotosizer is a free batch image resizer tool for windows. It allows you batch resize images using either percentage of width and height or by specifying a custom width and height. You can select individual files or entire folders for resizing, you can also include sub folders. It maintaines the aspect ratio of the images while resizing. It also supports resizing images for devices like iPod, iPhone, and Sony PSP screen sizes with preset sizes. Fotosizer is a multilingual app available in English, French, Gernam, Spanish and Italian. Not only resizing it also supports some simple editing like batch rotation, basic photo effects etc. It supports JPEG, PNG, BMP, TGA and GIF images. Works with Windows 98/Me/2000/XP/Vista.